Histology At A Glance - ubiq bookshop: the best place to buy books! This brand new title provides a highly illustrated and unambiguous introduction to the science, structure and function of cells, their related pathology, and in particular, helps readers master the basic principles of recognizing features of histological sections. 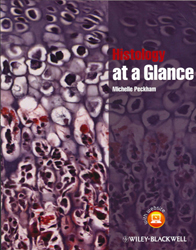 Histology at a Glance:* Presents the perfect combination of text and image; key concepts are explained and superbly illustrated* Provides coverage of all the main body systems and the components of the tissues of these systems* Features practical information on microscopy, including sample preparation and magnification* Includes hints and tips to help recognize features in a histological specimen, and overcome common difficulties* Contains self-assessment questions to help test learning and recognition, as well as lists of keywords to assist with revision* Links to the author's histological website, which features many more tips and samples, at www.wiley.com/go/histologyataglance Histology at a Glance is the perfect guide for medical, dentistry and biomedical science students, junior doctors, and is ideal for independent learning programmes in histology. Featured in the Feb / March 2011 Mostly Medical newsletter.